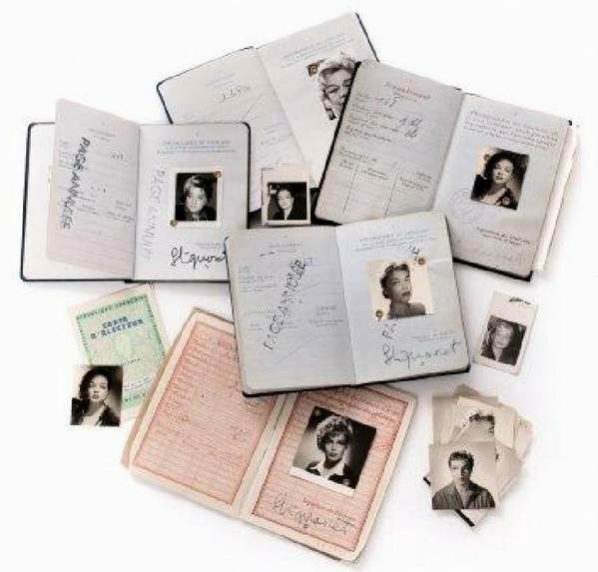 Not often you find passports from European actors / actresses at an auction but a French auctioneer just had a set of nine passports in total sold for a final price of €5070. Ivo Livi, better known as Yves Montand (13 October 1921 – 9 November 1991), was an Italian-French actor and singer. He began a career in show business as a music-hall singer. In 1944, he was discovered by Édith Piaf in Paris and she made him part of her act. Montand went on to international recognition as a singer and actor, starring in numerous films. His recognizably crooner songs, especially those about Paris, became instant classics. He was one of the most famous performers at Bruno Coquatrix‘s famous Paris Olympia music hall, and toured with musicians including Didi Duprat. During his career, Montand acted in a number of American motion pictures as well as on Broadway. He was nominated for a César Award for “Best Actor” in 1980 for I comme Icare and again in 1984 for Garçon! In 1986, after his international box-office draw power had fallen off considerably, the 65-year-old Montand gave one of his most memorable performances, as the scheming uncle in the two-part film: Jean de Florette, co-starring Gérard Depardieu, and Manon des Sources, co-starring Emmanuelle Béart. The film was a worldwide critical hit and raised Montand’s profile in the US, where he made an appearance on Late Night with David Letterman. These documents including three passports fetched €3000 plus premium. In 1951, he married Simone Signoret, and they co-starred in several films throughout their careers. The marriage was, by all accounts, fairly harmonious, lasting until her death in 1985, although Montand had a number of well-publicized affairs, notably with Marilyn Monroe, with whom he starred in one of her last films, Let’s Make Love. Montand died on 9 Nov 1991 on a film set by a heart attack. Simone Signoret ( 25 March 1921 – 30 September 1985) was a French cinema actress often hailed as one of France’s greatest film stars. She became the first French person to win an Academy Award, for her role in Room at the Top (1959). In her lifetime she also received two Césars, three BAFTAs, an Emmy, a Cannes Film Festival Award, the Silver Bear for Best Actress awards, a NBR Award and a Golden Globe nomination. Signoret was born Simone Henriette Charlotte Kaminker in Wiesbaden, Germany, to André and Georgette (Signoret) Kaminker, as the eldest of three children, with two younger brothers. 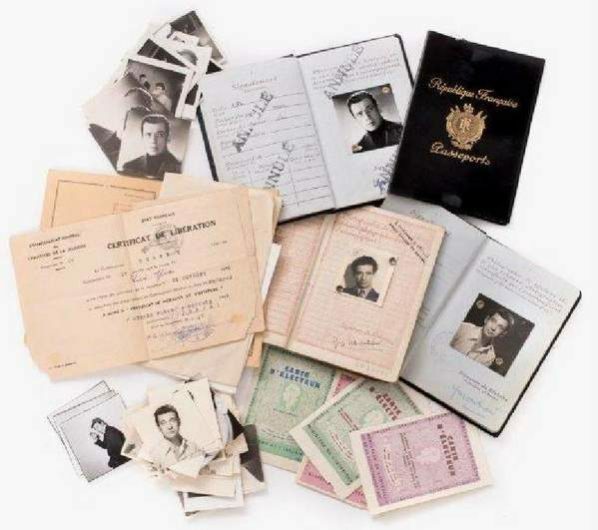 Her father, a pioneering interpreter who worked in the League of Nations, was a French-born army officer from a Polish Jewish family. Signoret died of pancreatic cancer in Autheuil-Authouillet, France, aged 64. She was buried in Père Lachaise Cemetery in Paris and Yves Montand was later buried next to her. Six passports and other documents fetched €900 plus premium.